Merrell says:"Move fast over terrain with these trail-responsive speed-hiking boots. This hiker's agile, sneaker-like feel comes from its innovative glove-like, low bulk waterproof upper that supports quick, aggressive movements and keeps feet dry, while the durable M Bound TRK midsole delivers instant ground feedback for precise, confident navigation over rocks, roots and mud." 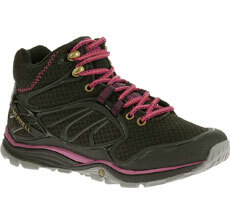 Merrell's Verterra are a good looking, lightweight and flexible, mid cut walking boot. They incorporate the Connect lining, the product of a recent collaboration between Gore-tex and Merrell. Other immediately obvious features are the good level of padding around the ankle cuff & tongue, the relatively simple yet effective lacing system and the 3mm lugged GRIP outsole. The fit is true to size - perhaps slightly wide (which suited me fine). The relatively simple lacing system enabled me to secure my foot well in the boot. However, it's once you get your feet in them that you appreciate what for me was the the stand-out feature of the Verterra; they feel as light and comfortable as a trainer but with a good level of support supplied by the sole/footbed construction. I've been wearing them out and about for mostly low level walking in Cheshire and some longer days in the Peak District. I've been walking on asphalt, concrete, wet grass and mud. Whilst I'd want a boot with a more toe protection and ankle support for very rocky/unstable ground, the Verterra have been extremely comfortable on footpaths and moorland. Traction on mud and wet grass is good; I did notice some slight slippage on very wet concrete .. but so did my companion in a different walking boot. They've kept my feet dry in moderate rain and when walking through wet grass. Extremely comfortable, Merrell's Verterra are a very light weight boot and are a great option for low to medium level hiking in Spring/Summer/early Autumn when walking on footpaths, over moorland, through woodland etc. You will need more ankle support for very rocky/unstable terrain or for carrying heavier packs. Great looking boot for more general leisure wear for those occasions when you need a good degree of cushioning and general comfort.